Well, my favorite time of the year has hardly ever been relaxing. I have been very busy for the past couple of weeks; couple of Christmas parties I hosted at my home, a few cooking classes I had to teach, and getting the Christmas cards and shopping done before it gets too late… But, I finally found some free time to be alone at home the other day and I was so loving it. 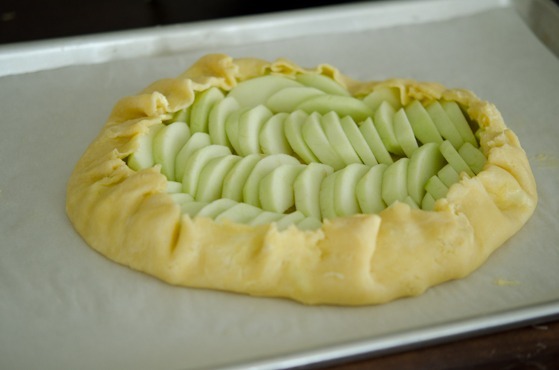 I made a very simple apple tart (or an apple galette if you rather want to call it that way). It is a classic French dessert. 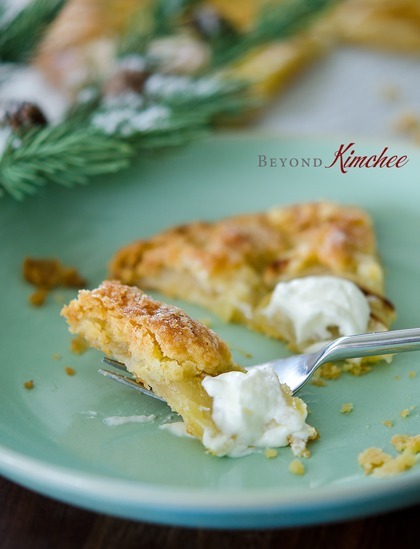 The flaky buttery crust with mildly sweet tender apples…, what a perfect treat for a quiet winter afternoon? 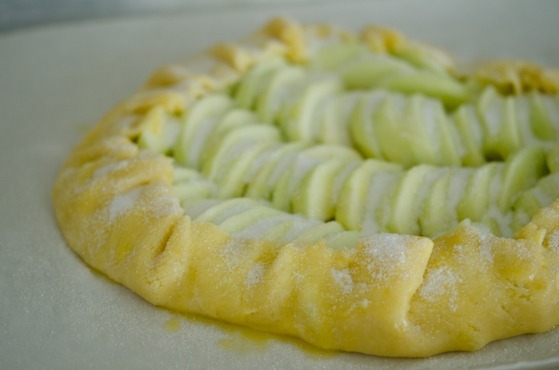 I would like to share with you a recipe for the simple apple tart. It is easy and simple to put together and looks so lovely for a presentation. And, of course, it is dreamy delicious. 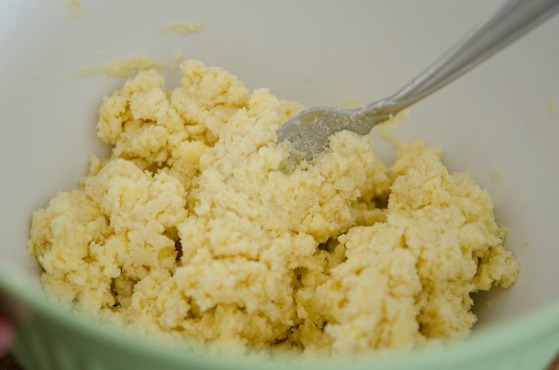 In a bowl combine flour, salt, sugar and add cubed chilled butter pieces. 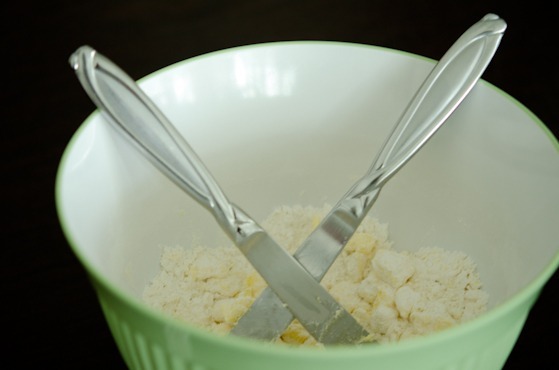 Using two knives cut butter into smaller pieces and the flour mixture resembles coarse crumbs. Or use a dough blender to do the job. Sort-a like this. Pea size pieces of butter remained in the mixture will create flaky crust. 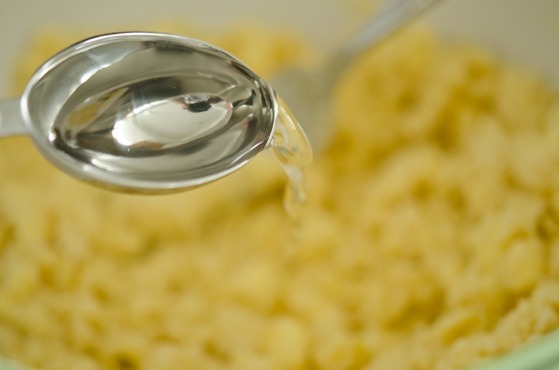 Start with 2 tablespoon of ice water to the mixture and toss together with a fork just until everything is moistened. Add more ice water if needed. Here it is. Gather it up to make a ball shape. Squish it down between two layers of plastic wrap. Roll it out to make about 1/8″ thick crust. Don’t worry about making the perfect round shape. I never could. By using plastic wraps you don’t need the extra flour on the board. Make sure to chill the rolled crust about 15 minutes before adding the apple slices. 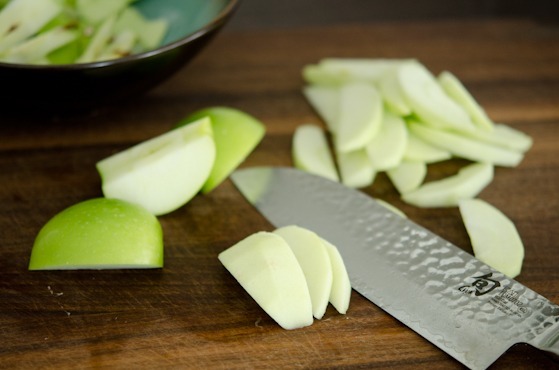 Peel, core, and cut apples to 1/4″ thick slices. Take out the chilled crust and remove one side of plastic wrap, and place on a baking sheet lined with parchment paper, then peel off the other side. Arrange the apple slices in a way that pleases you. Make sure you leave 1-1/2″ on the edge. Bring the edges toward the apples. I like the rustic look of this tart better than the one made in a tart pan. 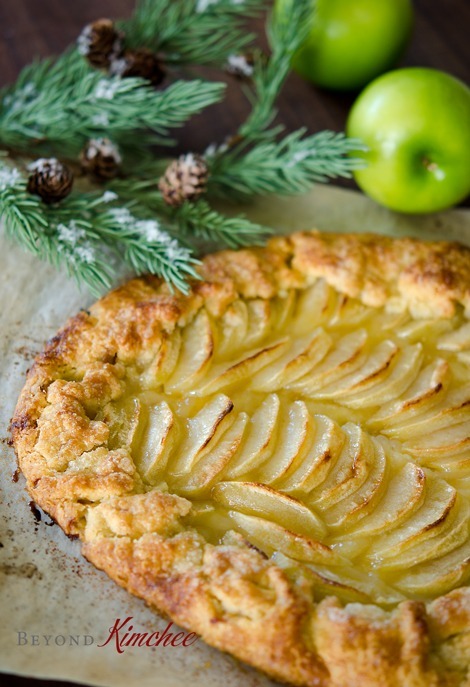 Brush the apples with a little bit of melted butter and sprinkle sugar all over on both apples and crust..
Bake the tart in 400 degree F. preheated oven for 40-50 minutes rotating the pan once or twice during the cooking time for an even browning. 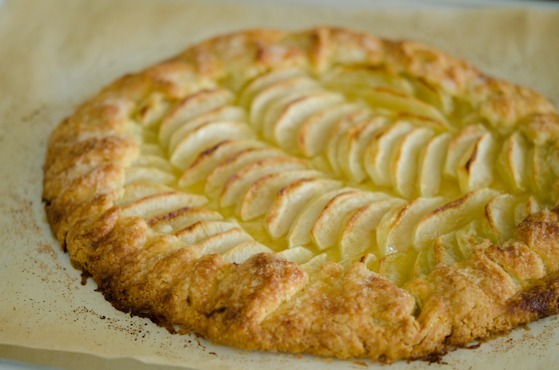 Here is a beautifully baked apple tart. Brush with heated apricot preservatives diluted in some water. This will give a nice shine but you can omit this step. It is not crucial. Serve this gorgeous dessert with a dollop of whipped cream or vanilla ice cream. I enjoyed a slice of tart alone listening Christmas music at my quiet house. Gazing at all the bells and whistles (ornaments) dangling on my Christmas tree, I pondered upon the greater gift and the feelings of peace and love that Christmas gives to all mankind. 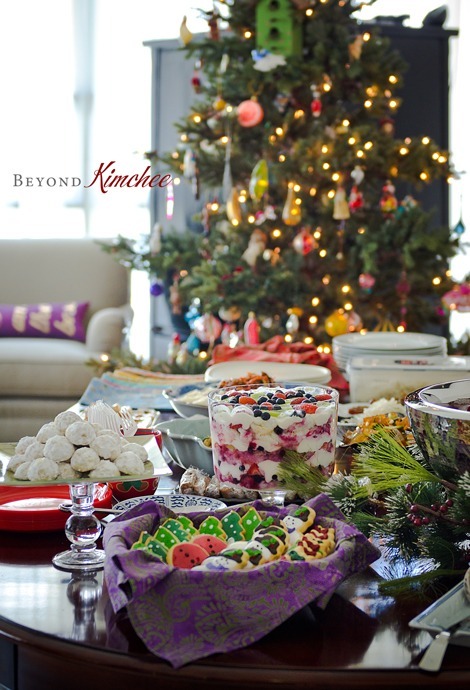 Some food do make you appreciate the season, don’t they? 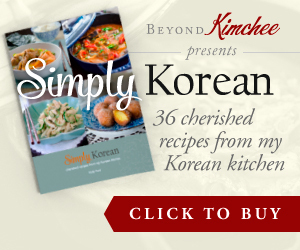 Hope you get to try this recipe. In a large bowl combine flour, sugar, salt. 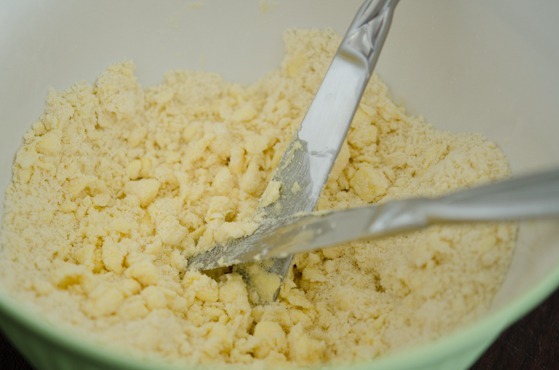 Add butter pieces and cut them with flour mixture until it resembles coarse crumbs. Add 2 tablespoon water first, using a fork stir the flour mixture to bring into a dough until everything is just moistened. Add a little more water if there are too many dry patches. 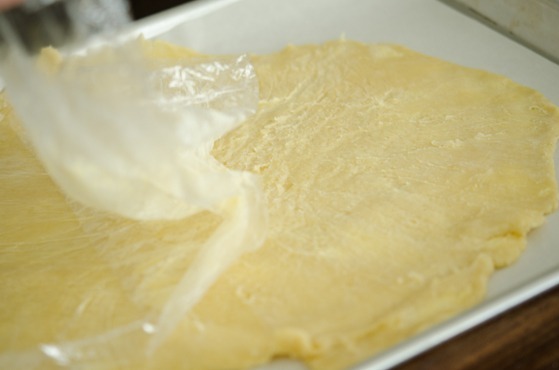 Place a dough in between two large plastic wraps. 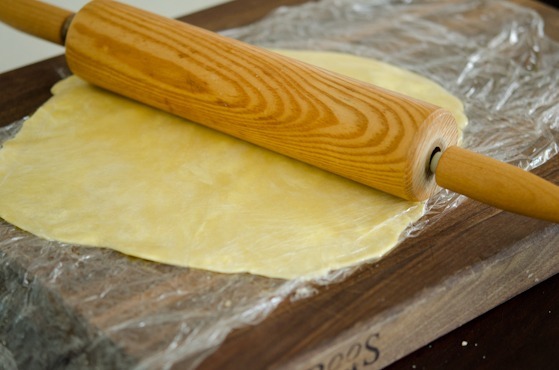 Roll the dough using a rolling pin until it becomes 1/8" crust. Chill the crust for 15 minutes. Peel and core the apples, then cut them into 1/4" thick slices. Line a parchment paper on the baking sheet. 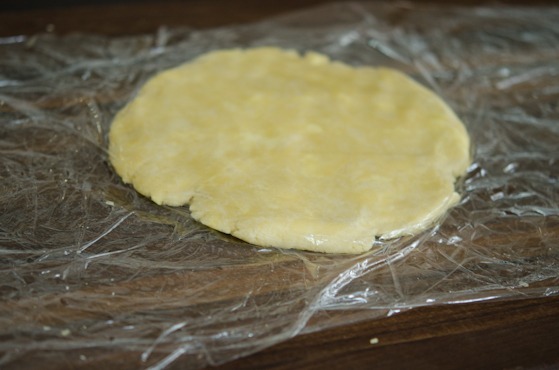 Peel off one side of plastic wrap from the crust and place it on the baking sheet facing down to the parchment paper. Remove the other side of the plastic wrap from the crust. 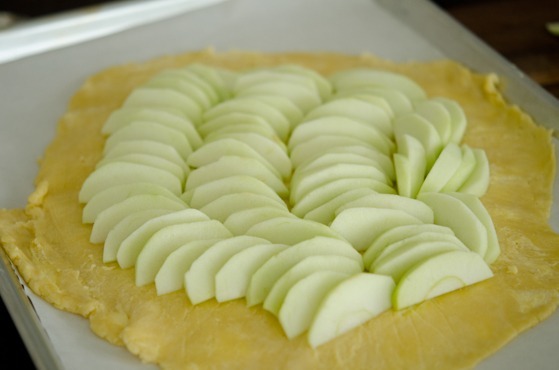 Arrange the apples on the crust leaving 1-1/2" edges. 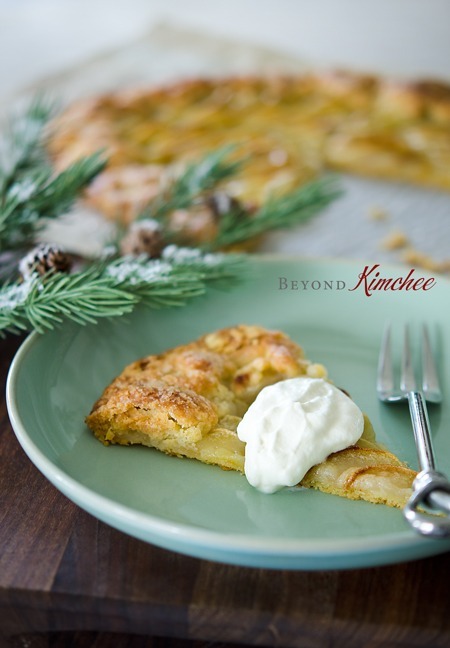 Bring the edges toward the apples and brush the apples with melted butter. 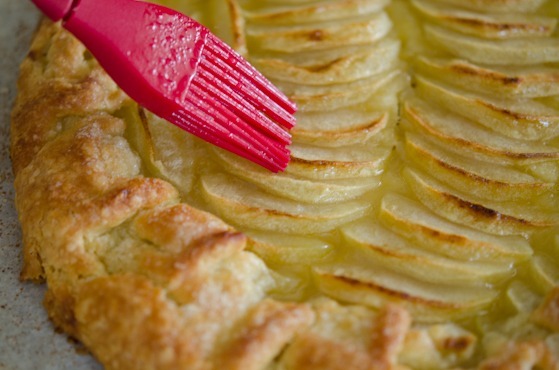 Sprinkle granulated sugar on both apples and the crust. Bake for 40-50 minutes until the crust gets nicely browned and the apples are soft (Turn the tart once or twice during the cooking time for a even browning). Mix apricot preserves with water and heat gently together in a microwave. Brush the tart with the apricot glaze to give a shine. Serve the tart warm or at room temperature with a dollop of whipped cream, cream fraiche, or vanilla ice cream. Should you ever be able to find them where you live, Golden Delicious apples are some of the best for cooking. Amazing flavor and their texture really holds up. Thanks for the great recipe! I really like making galettes - the free form pastry shape is so much fun. And apples are so perfect in this dish. Great job with this - it looks wonderful. Love the top picture. Your apple slices are so even and prettily arranged! 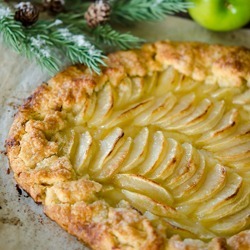 I used to make a similar galette (but much more, er, rustic in appearance). I can't imagine a lovelier way to celebrate an afternoon alone. This looks like such a great recipe! I hope mine turns our as nice as yours! The crust is heavenly, even with margarine instead (this lactose-intolerance lass has no other choice). However, I advise other recipe-testers to use the recommended amount of sprinkling sugar. Five tablespoons seemed like a lot, so I used three to my detriment. Too tart! I'll stick to the recipe next time. That crust looks absolutely PERFECT. Like a crust I would dream about :) Apple tart is my absolute favorite desert, yet I've only ever managed to find one place here in Bangkok that makes good ones, and that's a teeny tiny market stall. Even the big hotels here, there apple tarts are incredibly mediocre. Must try this!! I love how easy, pretty and delicious your tart looks. Thanks for sharing & Happy New Year! As I type this comment, the galette is getting nicely golden and bubbly in my oven. It smells divine! Your recipe was so simple to make. A keeper for sure! The only addition was a sprinkle of nutmeg on top since I love nutmeg on my apple dishes. Thanks Cathy. I hope it turned out great for you. Yes, I agree that nutmeg is a lovely addition to apples. OK, now it really and truly is out of the oven and has been devoured!!! It was a huge hit and I can't wait to try this again with no changes...except for my hint of nutmeg...I shared this on my Facebook page and several friends said that they would be trying it too. 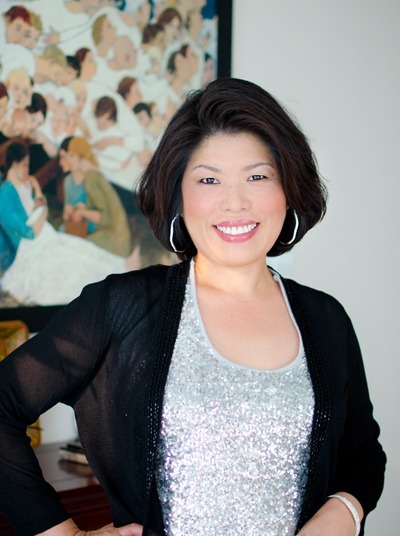 Thanks for sharing on your facebook, Cathy! I am so happy to hear that it was a huge hit.